Turmeric has shown to be a powerful antioxidant and anti-inflammatory as well as aiding in digestion and minor digestive disturbances, promoting general wellbeing and helping the healing process of minor skin irritations. It is no wonder more and more health care professionals are recommending adding turmeric to your daily supplement intake. BUT…What most people don’t know is that turmeric is great for our pets as well. That’s right, whether you have a dog, cat, horse, goat, bird or alpaca, all our furred and feathered family members can also benefit from a daily dose of Turmeric. How to use Turmeric for pets? Dr Andy Pieris BVSc (hons) is a vet and owner of Casuarina Seaside Vet in NSW, with her husband Josh, also a vet. The clinic itself is recently built with a beautiful, clean and uplifting design with the beach only metres away. While the clinic is new, they are always busy! There is a gorgeous, young team there to support Dr Andy and the animals that come to the clinic. Graduating from University of QLD with Honours in 2009, Dr Andy worked for 2 years as a large animal vet before focusing on dogs and cats. Loving life and what each day brings allows Dr Andy to have fun at work and she strongly believes it doesn’t feel like work when you love what you do. Growing up in Queensland, her love of animals was evident with goats, horses, cats, dogs and more part of her life at home. 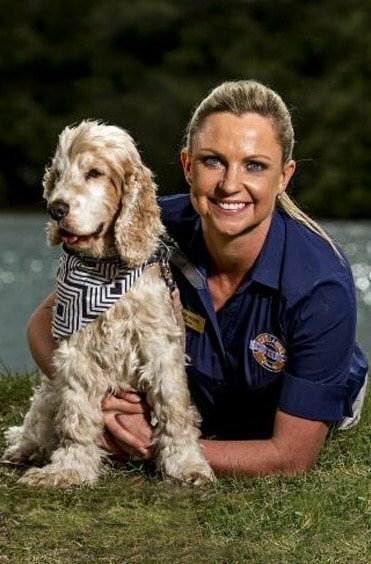 Dr Andy has seen the benefits for turmeric for animals as an anti-inflammatory and for general health and wellbeing first-hand with her beautiful Cocker Spaniel, Goonie. His daily food contains Turmeric, which he loves the taste of, and is seeing him through his senior years. I have a 4year old American Bulldog that was just diagnosed with cancer. Although, after surgery he is in remission, the cancer cells are very aggressive and 2 vets were only slightly optimistic. He started chemo 2 weeks ago and I’ve been making the Turmeric paste (I add raw honey to the mix, I just eyeball it) and put it on his food. The vets were very concerned about his white blood cell count. I got a call today after the vet drew my dog’s blood Tuesday that he is doing GREAT. She, the vet sounded very optimistic. I’m not one to necessarily believe in miracle cures, but for now, he’s doing great and I’m going to start putting it on my food also. For those that want to know, he weighs 104lbs and I drizzle 2 tablespoons over his food, warmed up slightly in the microwave. Totally recommend it! We give our dogs 1/2 tsp per day. One of my dogs had a lump on her leg, the vet wanted to operate for $600. Three weeks on turmeric the lump has gone. My dog has suffered from pain in his back leg for nearly three years and he was having an injection from the vets once a month. I was told about adding half a cup of organic turmeric, 2cups of water, 70mls of coconut oil, 2tbs of cinnamon and a tsp of cracked pepper, simmer until mixed and then out into the fridge. I have been giving him half a tsp night and morning since July last year. I noticed a vast difference in the first three weeks. He now no longer limps and is running and jumping everywhere. I would absolutely swear by Turmeric it is fantastic!!!! Hope this is of some help. I use several capsules when I cook the dog food for the week seems to have healed his bowels motions now normal after years of struggling to keep him healthy and his arthritis has also improved ..he will be 15 in October. We have a beautiful standardbred horse named Dean. He came to us with his name and tail rubbed raw from the itch. Last summer we gave Dean a heaped tablespoon of Tumeric in his daily feed. Now he has a tail with hair and has started to grow a mane. We tried many remedies but none worked. Turmeric is in a league of its own. I put my dog Mollee on it about 6 months ago after my success with it, I give it to Mollee for the anti-inflammatory properties and find it awesome, highly recommend it for animals as well as humans. I keep & breed a number of Australian & Exotic species of parrots. Over the last 12/18months, I have been including Tumeric into their diet twice a week. All birds seem more resistant to common ailments & showing better feathering & colour. Natural may take its time to show the benefits, but it certainly does SHOW. Very happy with this product, both my dog and I take the turmeric capsules for our knee injuries. He is much happier and moves well when he has his turmeric capsule in cheese for supper. I put my 14-year-old dog on it after a bout of pancreatitis he suffered and was having trouble recovering from. His energy levels increased after 2 weeks and he now has a puppy like bursts of energy. I swear by this product. For me and the pooch, it really works!